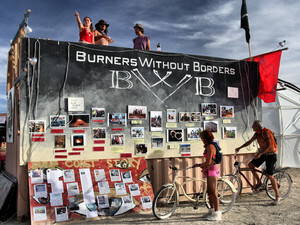 Burners Without Borders (BWB) facilitates community leaders interested in taking the Burning Man principles from the playa out in the world by gifting their time and talents to collaborate with others and better our world. The Burners Without Borders website is intended to be the mouthpiece for this community’s efforts as well as a catalyst for inspiring new ideas. Join us and get involved! BWB is a grassroots, volunteer-driven, community leadership program whose goal is to unlock the creativity of local communities to solve problems that bring about meaningful change. Supporting volunteers from around the world in innovative relief solutions & community resiliency projects, BWB is known for the unbridled creativity they bring to every project they do. Burners Without Borders coalesced from a spontaneous, collective instinct to meet gaping needs where traditional societal systems were clearly failing post Hurricane Katrina. Since that time, BWB has emerged as a community led, grassroots group that encourages innovative, civic participation that creates positive change locally. Following the 2005 Burning Man event, several participants headed south into the Hurricane Katrina disaster area to help people rebuild their devastated communities. As the volunteer numbers grew, they focused their initial efforts on rebuilding a destroyed Vietnamese temple in Biloxi, Mississippi. After several months, that job done, they moved to another needy Mississippi community, Pearlington, to continue to work hard — gifting their time — to help those in need. Over the course of eight months, BWB volunteers gifted over $1 million dollars worth of reconstruction and debris removal to the residents of Mississippi. Burners Without Borders is not affiliated with Doctors Without Borders, which is a registered trademark of Médecins Sans Frontières International.